DreamWear features three frame sizes and four nasal pillow sizes, so you can find the fit that works best — and most comfortably — for you..
DreamWear’s unique “top-of-head” design offers many of the benefits of nasal and pillows masks. Allowing more freedom of movement and more comfort, DreamWear patients feel like they are not wearing a mask at all. Right and left side air flow chambers ensure maximum oxygen, even for side-sleepers. This mask is perfect for those who want minimal contact. The minimal contact, under-the-nose cushion prevents red marks, discomfort or irritation in the nostrils or on the nose bridge. 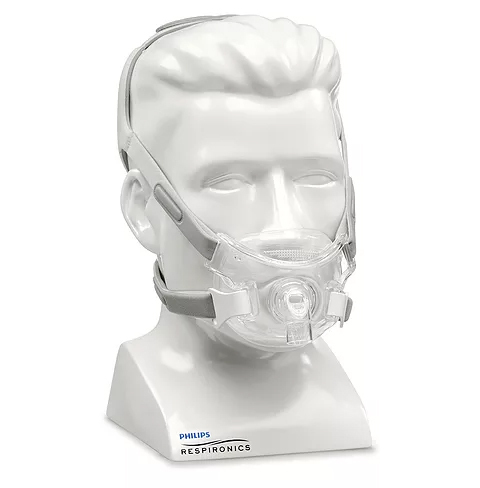 Best for patients accustomed to sleeping with their mouth closed, who want the lightest mask available. Let one of our oxygen specialists help you select the right unit for your oxygen needs. Please fill out our easy form below for more information.